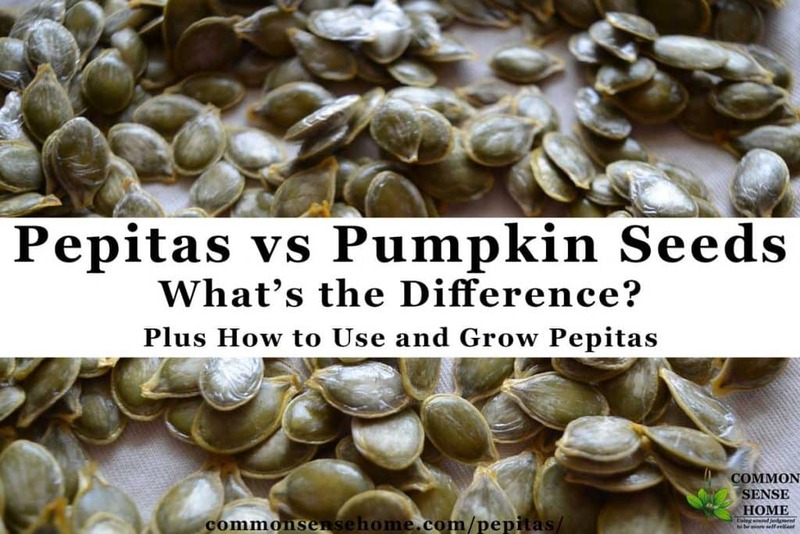 What’s the difference between pepitas and pumpkin seeds from your jack o’ lantern? There’s not some mysterious machine removing the tough white shells from pumpkin seeds. 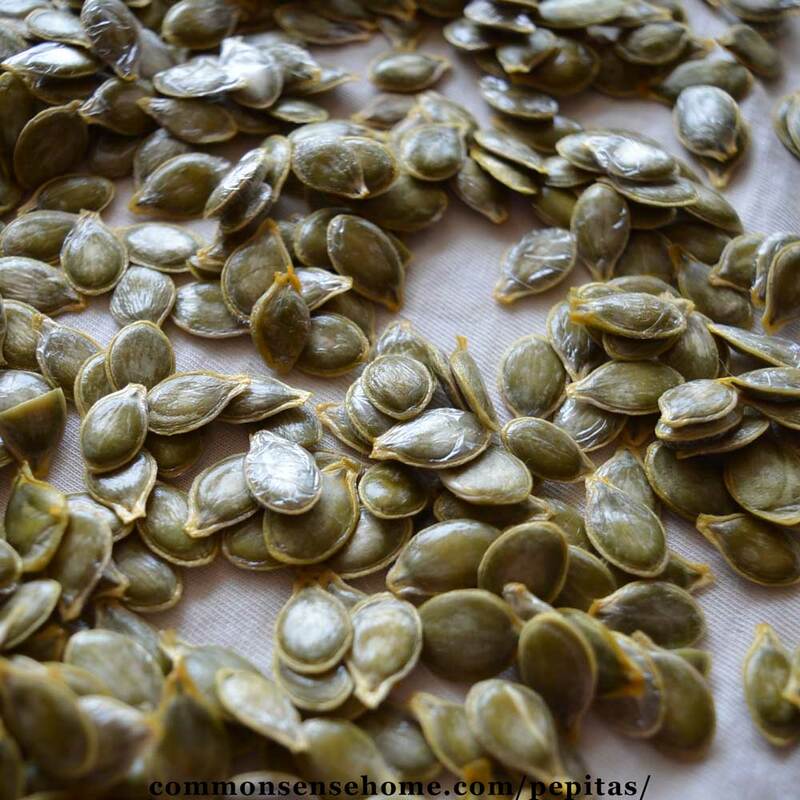 Instead, pepitas come from what are known as “oilseed pumpkins”. Oilseed pumpkins produce pumpkin seeds that have a thin, papery shell – which is great for those of us who want to enjoy the health benefits of pepitas but don’t like a mouth full of shell. In this post we’ll tell you a little more about these tasty morsels, how to use them and how you can grow your own pepitas. Pepitas or hulless pumpkin seeds come from a specific type of winter squash known as oil seed pumpkins or Styrian pumpkins. Instead of the hard white seed coating we see in standard “Halloween pumpkins”, these pumpkins have a very delicate skin on the seed that comes off easily. 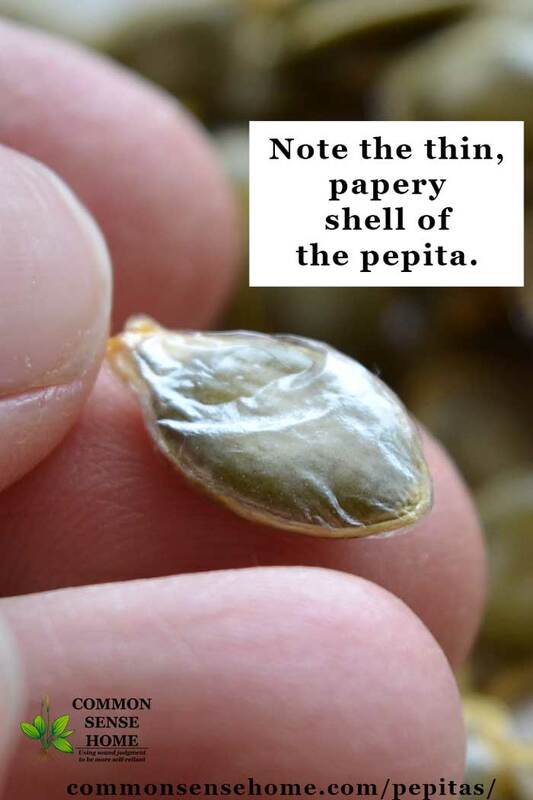 The pepitas themselves are flat, oval-shaped green seeds with a point at one end. Technically, both hulled and hulless pumpkin seeds can be called pumpkin seeds or pepitas, but when someone says “pepitas”, most people who know about them think of the naked seeds. Pepitas are loaded with nutrition. Just 1/4 cup (32.25 grams) provides significant amounts of manganese, tryptophan, magnesium, phosphorus, copper, protein, zinc and iron. The World's Healthiest Foods sites studies that suggest pumpkin seeds may promote prostate health, protect your bones, act as an anti-inflammatory and lower cholesterol. How do I use pepitas? I enjoy pepitas as low carb salad topper or snack, but you can use them like you would use other seeds or nuts. Try pepitas in granola bars or trail mixes, in muffins or cookies, or savory dishes. Warning – Pepitas may be addictive! Personally, I have a hard keeping them in storage once they're prepared, as they are so tasty! Like most things you grow at home, they seem to me to be just a little fresher and brighter in flavor than their store bought counterparts. You can get quite a few fruits from a hill of pumpkins, but each pumpkin will yield less than a cup of seeds, which is why pepitas are so pricey in the store. To make your pepitas easier to digest, I recommend soaking or sprouting to reduce phytic acid. You can use this preparation with home grown pepitas or purchased raw pepitas. When buying pepitas, make sure they smell fresh, not musty. As the seeds get older, the oils in them can go rancid. Note: You can also use these techniques to improve the flavor of raw commercial pepitas, which tend to be rather bland. 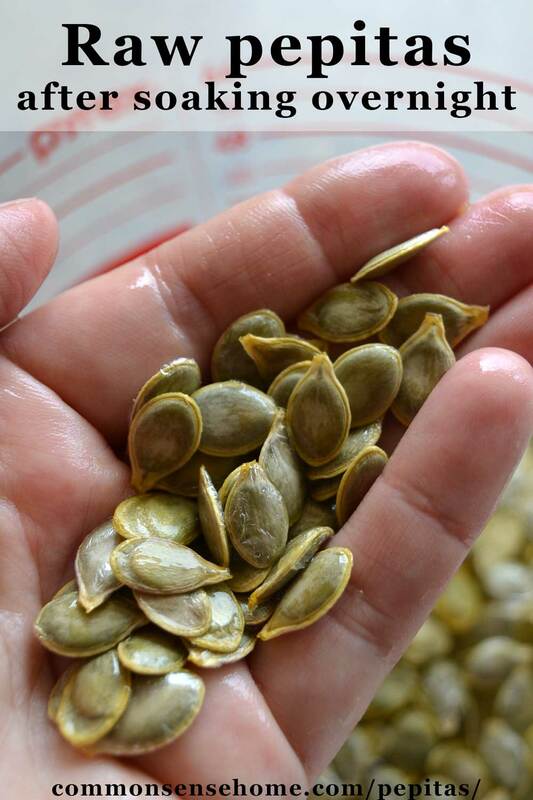 If harvesting from a fresh pumpkin, scoop out seeds and rinse off the pumpkin goobers. 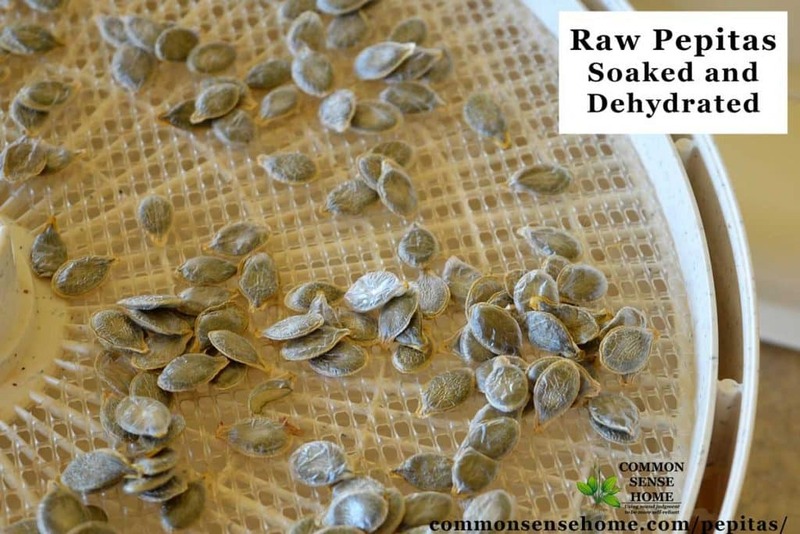 Place your raw pepitas in a medium bowl with enough water to cover. Add 2 tablespoons salt. If you’d like a little heat, you can also add a teaspoon of cayenne pepper. Cover bowl with dish cloth and leave in a warm location to soak for at least 7 hours or overnight. Drain in colander. To dehydrate, toss seeds with a bit more salt or seasoning, if desired, and dry at less than 150°F until crispy, 8-12 hours. (Don't add extra oil.) Mix the pepitas a couple of times during drying, as they tend to stick together. Once the seeds are dry and crispy, store them in a tightly sealed container. (Wide mouth mason jars work great.) The seeds at the top of the post were dehydrated with no extra salt. To oven roast your pepitas, drizzle lightly with olive oil or sesame oil and toss with seasonings or additional salt, if desired. Toast until crispy, mixing every 15 minutes to half hour. At 250°F it'll take around 45 minutes to an hour to get them crispy, at 150°F it'll take 8 to 12 hours. These should keep for a week or two in a tightly sealed container. If you want to grow pepitas, it all starts with right pumpkin. 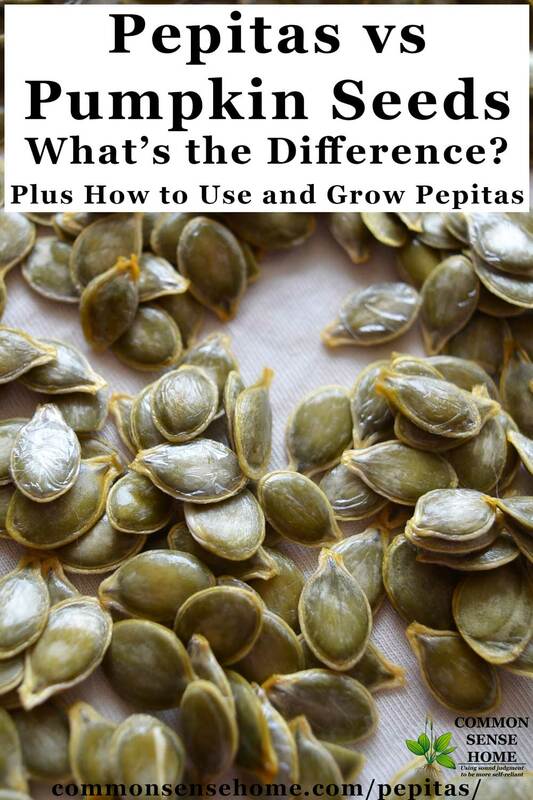 As mentioned above, pepitas are pumpkin seeds that come from winter (long season) cucurbits (Cucurbita pepo L. group Pepo, Cucurbitaceae) with seeds that lack a tough outer hull. Other varieties are also available – look for the words “hulless”, “naked seed”, “oil seed” or “Styrian” in the description. Pumpkins and winter squash like heat and rich soil. 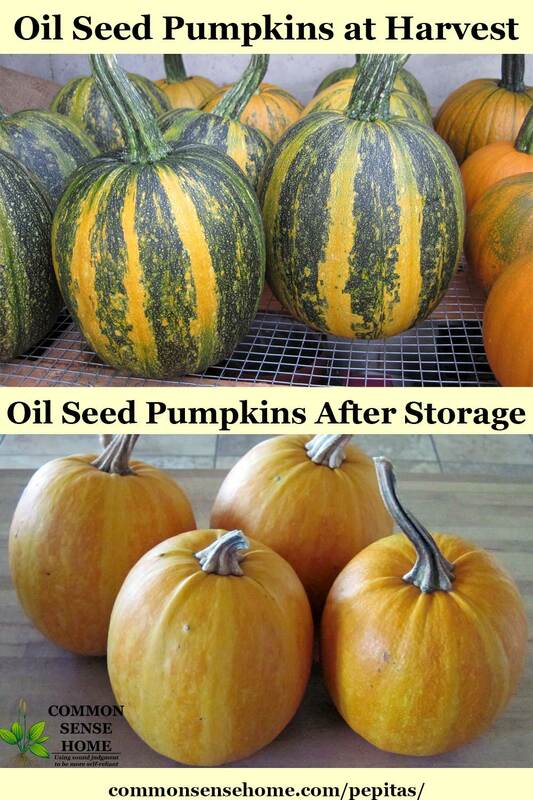 Oil see pumpkins are particularly susceptible to rot during germination because they lack a touch outer hull. Make sure your soil is warm and not too wet before planting. Work in some compost or rotten manure before planting. You can preheat the soil with garden black plastic or sturdy landscape fabric. Plant pepitas seeds in hills, with 3-4 plants per hill. Space hills around 4-6 feet apart. Alternatively, place plants 12-18 inches apart in rows. Seeds should be ½-1” deep. Preferred soil temp is at least 65°F. Up to 90°F is acceptable during germination. Once plants are growing, mulching may be helpful to keep soil temperature between 65-75°F. Here in the upper Midwest, I typically start my pumpkin plants inside in 2-3 inch pots, two to three weeks before planting out in the garden. Do not plant out until all danger of frost is past, unless you give the plants protection. Try not to disturb the roots too much when transplanting, as rough handling will set the plants back. I like to keep the transplants small to avoid them becoming rootbound, which increases the risk of injury. See “Starting Seeds Indoors” for more seed starting tips. Another option I’ve used to jumpstart my pepitas seedlings is to cover where the seeds are planted with mini-greenhouses made out of old vinegar jugs with the bottoms cut out. I keep the covers on until the seedlings have a set of true leaves. The covers should be removed on a slightly overcast day with minimal wind. Alternatively, you can take the covers off for a few hours each day for several days to help get the plants used to exposure. 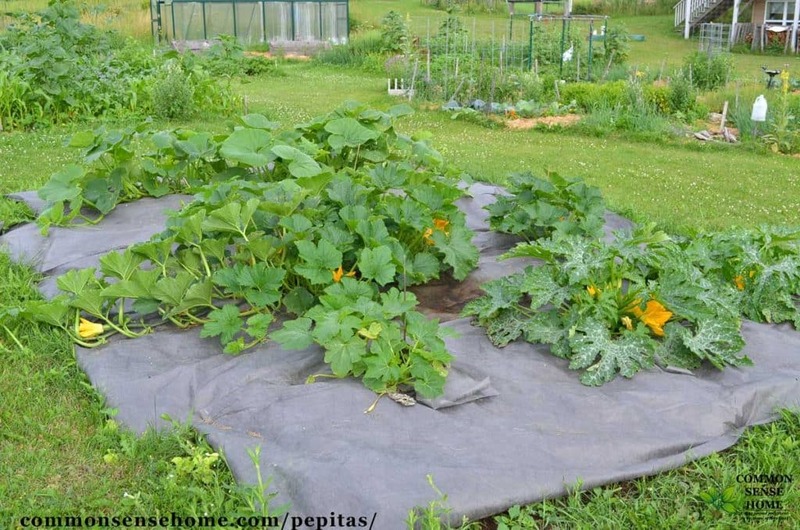 Sometimes I plant my pumpkins (including pepitas) in beds that are completely covered in half-rotten manure. The manure sheet composts right in the garden. I add some dirt where the pumpkin hills are (or dig some up from below the manure) so the seedlings have a spot to get established. (They won’t grow directly in the manure if it is too fresh.) The bed gets covered with heavy duty landscape fabric, and the vines sprawl all over. The composting manure adds gentle heat to the bed and fertilizes the plants all season long. For best storage life, wipe off any loose dirt and cure at warm temperatures for about a week (I cure them in my greenhouse) before moving into cool dry storage (50 to 55 degrees Fahrenheit, 60 to 75 percent relative humidity). Stored like this my pumpkins have lasted into March and April the following spring, so I have months of fresh pumpkin seeds on hand. The only down side with the oil seed pumpkins is that the flesh isn't particularly tasty. It tends to be stringy and bland. For most pumpkin recipes, I prefer to use winter squash, as the flesh is denser, smoother and sweeter. If you want to use the flesh, I suggest using it similarly to large zucchini, or maybe in spaghetti squash recipes. Chickens love it, too. 9 Thrifty Pumpkin Decorating Ideas – All Under $10! I’ve had such an urge to eat nuts and seeds lately. I think I’m low on magnesium. Of course, they could just be tasty. Quick question – how are the pumpkins? I mean, is the pumpkin flesh good for things like pies or breads, or is it more watery, like jack-o-lantern type pumpkins? I will probably try them either way, but it’s helpful for me to know for planning purposes. Thanks! Laura – yes, the flesh it bland, as I noted near the bottom of the post. Edible, but not too tasty. I usually pass it along to my friends who have chickens and use our squash for “pumpkin” recipes. Sorry I missed that the first time reading. (There were several things going on at the same time.) That works fine for me – I have chickens, turkeys, etc., so I will plan to use the seeds and share the rest with my birds. Thanks! No worries! I miss stuff the first time through, too. This post rules! This is like exactly everything I wanted to know when I was like, how do I make this deliciousness happen for myself? Dig your site, put me on your e-mail list please!!! Almeta – you can sign up on the left sidebar for the delivery method of your choice. I have grown the ‘kakai’ variety of oil pumpkin for a few years. The vines are only 5 to six feet long with three fruit per vine. I usually cut the third one off so the other two get much bigger and yield more seed. Don’t HACK them open, after storing in a cool place for a few week cut the pumpkin around the circumference and twist it open. The seed are easily pulled out with your thunb and forefinger a good quantity. I just rinse them off in a collander and let them fry from there. Stir a couple times a day to distrubte air. They dry quickly at room temp. They will have a papery skin on them . I either rub that off between my palms, or not. The seeds are best uncooked. Why take a chance on baking the vitamins and omega fatty acids out of the seeds when they taste great raw! It’s hard not to eat them all. But you must save a few seeds for the next generation to plant. I got over a thousand seeds out of three pumpkins.. So planting the short vining Kakai variety you can get grow a few in a small space and get a sh*t load of nice plump green seeds. Did you seriously count the seeds? I’ve got some Kakai seeds waiting patiently for warmer weather here. I would like to buy some of you seed. How do we handle this ? I don’t have seed available for sale, since I don’t grow enough plants to maintain a stable gene pool. 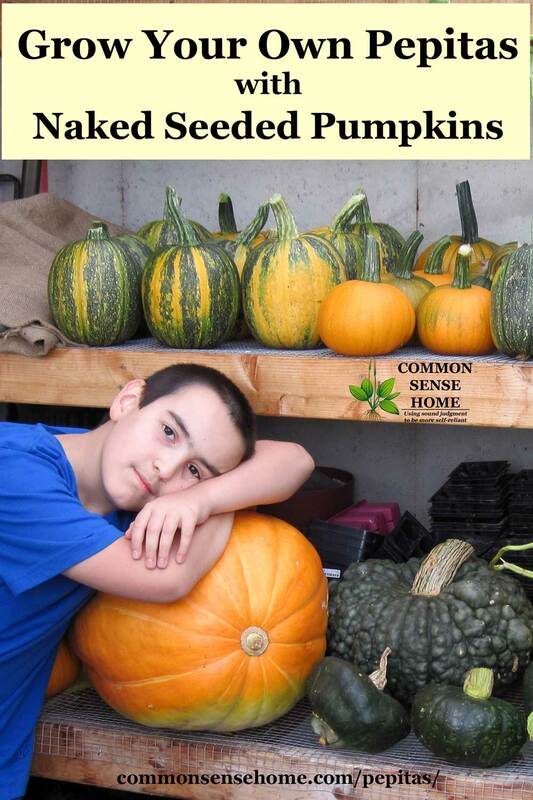 Seeds are available online through Amazon.com and a variety of seed catalogs. Glenn, I don’t know if you’re still subscribed to comments on this post, but if you are… how did the flesh of the Ukrainian hullless pumpkin work out? Was it any more interesting than Kakai or the typical Styrian pumpkin? If so, do you have any seeds of those? Dont fry them dry them. sorry for the typos , got excited. Help! I planted, outside at the same time as all my other pumpkins, a package of hulless seed called Beppo that Territorial Seed Co. carries. Not one came up. Territorial sent me another pkg. that I planted inside to have more control over the water ect. 10 days into this and no sign of life. I dug a seed out 2 days ago and it was mushy. Is the problem this variety? I haven’t tried Beppo, but in a normal year, the varieties I’ve tried have germinated as well as other pumpkin/squash varieties. My friend, Deb, however, has has trouble direct seeding hulless pumpkin seeds in her garden. Most years I start mine inside to get a jump on the season. This year I got a late start and direct seeded, and it was so wet hardly any of the squash and pumpkins came up. Hi There. I would like to grow my own but no land available. Could you please give me a hint which is the best producer or wholeseller to get raw hopefully organic pepitas in bulk? Hi, a great post, thank you. Not sure if these types of pumpkins are available here in Tasmania, Australia, but I will certainly look for them. The only pepitas one can buy here are from China, ….and…i am always very dubious of their hygiene over there. Thanks again. Oh, fantastic!! Thanks for that! Don’t know if they will allow them into Tasmania but I will check that out. Thanks heaps. Do you remember what ratio of salt/water you use for the salted water step…? 🙂 thanks! Sorry! I never measure exactly, but I should include an estimate. I use enough water to cover the seeds, and a couple teaspoons of salt for small batches, a couple tablespoons for large batches. I bought a superb hulless pumpkin seed labelled organic in a Hilo natural foods store in the late 90’s, but have not since encountered a variety with that appearance or taste. It was not gown in Hawai’i, and I have a vague sense that it may not have been domestic. It was well cleaned, very dark green, long, slender, symmetrically elliptical, with very pointed ends. Would love to find viable seed for that variety! The next best seed I have grown came from Horizon Seeds, which is now dba Strictly Medicinals. Their Kakai Pumkin Seed yielded a wonderfully fragrant (almost floral), deep dark green and tasty seed with pale yellow and pleasantly mild, sweet, tender, if slightly pulpy flesh. My first exposure to bulk pumpkin seed was a Chinese version that was organic, but poorly processed and reliably speckled with traces of mold, to which I was severely reactive at that time. As a result I started saving and drying every seed I grew, cleaning and drying them to re-plant if productive enough, but a good portion were dried, rubbed of their papery cover and cracked op for asnack. My favorite was from Hubbard Squash. A few, particularly from Butternut and from Delicatat, tasted bitter. I found that my chronically splitting nails became very healthy, and it must be that my bones were benefiting, too. The super manure treatment that has been working well for me comes from John Lewis’ “Cold Climate Gardening” in which he recommends digging a hole 2 foot deep, burying a good shovelful of rotted manure in the bottom, filled next with a 50/50 mix of rotted manure with soil, and then a hill of good seedling soil. I learned to lay a 3’x3′ collar of cardboard over the manure layers, cut an “X” in the center, set my soil hill over that and when planting my seedlings be sure to dig my planting hole down to and a little into the “X”. This kept weeds from shading out my young squash, and a couple of weeks into growth when the plant had developed a bit, it reached the manure, turned deep green and grew like little monsters for the rest of the summer, yielding great squash. On the pumpkin seed varieties, I tried thinning to two or three and did find that they grew bigger, but lately the early frosts have been making me think I will leave a few more on the vine to increase the number of survivors when the foliage dies back. I grew the Lady Godiva pumpkins this year & had decent sized pumpkins but when I cut into the first one I only found 4 of the nice green pumpkins seeds & the rest were small, soft white ones. Did I shut into it too early or what else could have gone wrong? It sounds like the pumpkins didn’t have time to fully mature. They should be allowed to stay on the vine until frost threatens or the vines die back. So the best way to consume is to soak overnight, then dehydrate another night. So 2 days of prep before eating? Does the 250 dehydration roast them? I just want mine crispy-ish. 250 F roasts them. Degree of roasting and crispiness is determined by the amount of time you roast them.